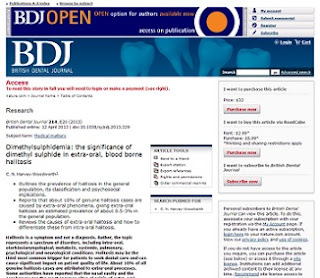 ...your BDJ paper "Dimethylsulphidemia: the significance of dimethyl sulphide in extra-oral, blood borne halitosis," was one of the top ten most viewed 2013 BDJ articles in May. How great is that! And it will have been written only two months ago on June 12th. 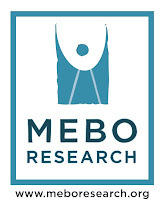 This is indeed an honor for MEBO Research to have such an expert who has given countless hours of his valuable time and pro-bono work to support MEBO’s Mission. This work of his has contributed greatly to our Raising Awareness Campaign (scroll down on this link to see all posts). Outlines the prevalence of halitosis in the general population, its classification and psychosocial implications. Reports that about 10% of genuine halitosis cases are caused by extra-oral phenomena, giving extra-oral halitosis an estimated prevalence of about 0.5-3% in the general population. 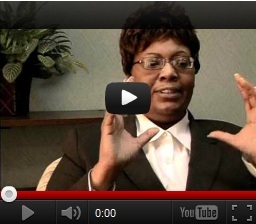 Reviews the causes of extra-oral halitosis and how to differentiate these from intra-oral halitosis. In addition, some of the readers of this paper in the month of May 2013 were from our community. When I say our community, I mean any and all sufferers from all forums, blogs, Facebook pages, websites, and partnership sites like RareConnect, for example, whoever suffer from any BB/BO condition, are family members of, or are simply interested in a greater understanding of breath and body odor conditions. ALL OF US BELONG TO THE SAME COMMUNITY! This is who we are – one voice in our Raising Awareness Campaign, whether we are writing articles on breath and/or body odor conditions or reading articles written by our experts! Whether we suffer from halitosis, body odor stemming from IBS and/or other similar digestive tract disorders, or TMAU, Bromhidrosis, or a combination of these, we become a significant and effective force when we present ourselves, and are perceived as, a unite cohesive group – one community in our Raising Awareness Campaign. No matter what forum or site we call home! very talented and beloved author. Awsome, it is uplifting to read this, it feels good to know people are helping not judgeing, this does help us get back up when people try to knock us down!!!!!!!! Thank You to everyone in the community.